In recent weeks and months, there’s been a run of papers—with typical mainstream media misinforming embellishments—about improved estimates of the warming of the oceans…and blog posts about them. One thing common to the papers is the use of the metric zettajoules for ocean heat content—a metric that’s meaningless to most people. The former National Oceanographic Data Center (NODC) portion of what is now contained under the umbrella of the National Centers for Environmental Information (NCEI) produces a dataset of depth-averaged temperatures for depths of 0-2000 meters, upon which, in part, their Ocean Heat Content data are based, and it’s presented in degrees C. To put deep-ocean warming in perspective, I’m presenting that data in this post. Sadly, with the government shutdown, the NCEI website is offline, so I can’t provide you with links to additional information about the dataset. That is, we can’t confirm during the shutdown that this dataset is made up primarily of data from ARGO Floats. 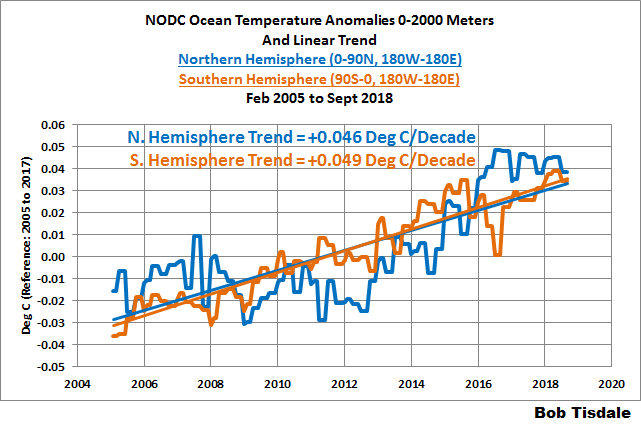 I did, however, present this same dataset and discuss its foundation in an October 2014 post There is a Wide Range in the Argo-Era Warming (And Cooling) Rates of the Oceans to Depths of 2000 Meters. The WattsUpWithThat cross post is here. Of course, today, the links to the NODC website there will bring you to reminders of the government shutdown. 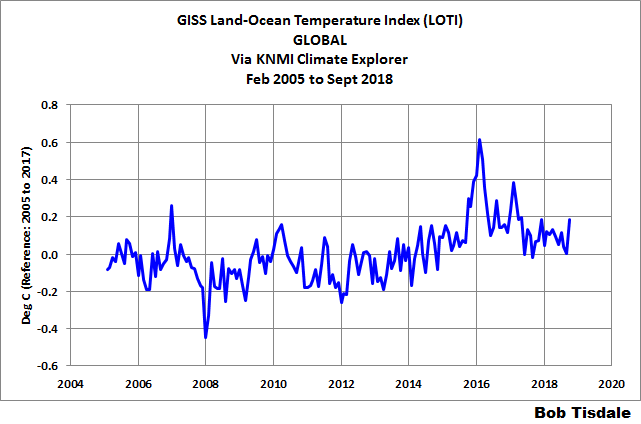 The NCEI’s subsurface ocean temperature anomaly data to depths of 2000 meters are available through the KNMI Climate Explorer, but there it’s still identified as NODC data. Regardless, with the KNMI Climate Explorer, we can examine the data regionally—for individual ocean basins and parts of them. The KNMI Climate Explorer also allows users to create trend maps, so we can see where the oceans have warmed to depths of 2000 meters, where they have not warmed, and where they’ve cooled…yes cooled. 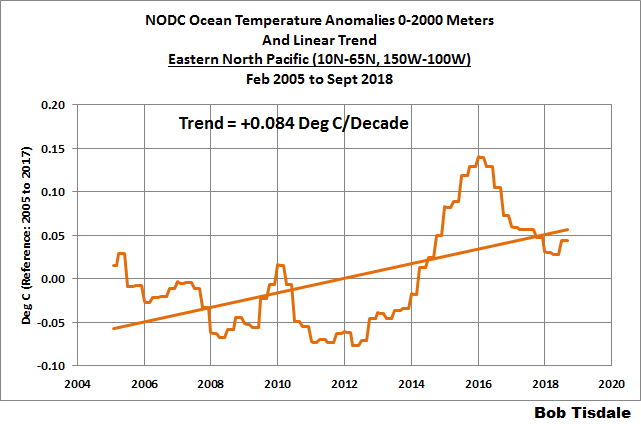 The data start in 2005, so it’s not a long term dataset, but the intent of this post is to put deep-ocean warming in perspective for readers so the short time span is not a concern. And to simplify matters, I’m going to call it NODC data, as it is identified at the KNMI Climate Explorer. Keep in mind the average depth of Earth’s oceans is about 3,788 meters, so we’re examining a little more than the top half. 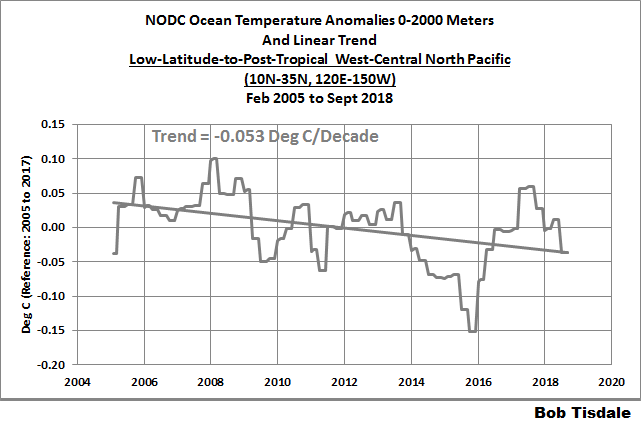 Figure 1 presents the NODC depth-averaged temperature anomaly data for the global oceans, from pole to pole, from February 2005 to September 2018. 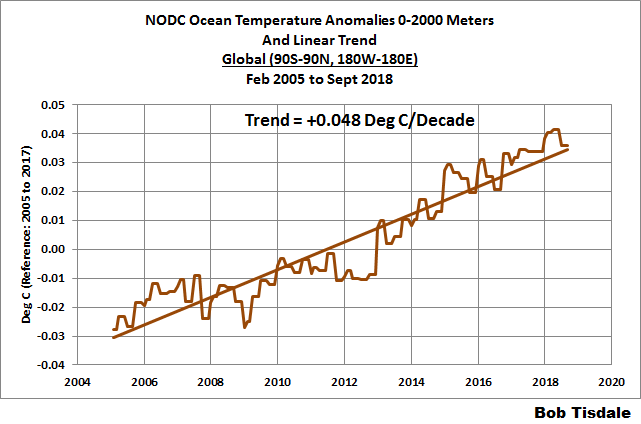 Based on the values of the linear trend line, the temperature of the global oceans for depths of 0-2000 meters has risen about 0.065 deg C since 2005. (As a reminder, 0.065 deg C is read sixty-five one-thousandths of a degree Celsius.) One thing you will note in Figure 1 is all the tiny steps in the data. The reason: The NODC produces that data on a quarterly basis, while KNMI presents it monthly. Instead of whining about how much the Earth’s oceans have warmed, assuming that increasing levels of CO2 are solely responsible for that warming as is commonly believed, people should be thankful we live on a planet where the oceans can absorb the vast majority of global warming (90%, they say), with so little effect. Figure 2 presents the data for the Northern and Southern Hemispheres. The data indicate the oceans to depths of 2000 meters in the two hemispheres warmed at similar rates. BUT, big but, the similarities do not necessarily extend to the individual ocean basins. 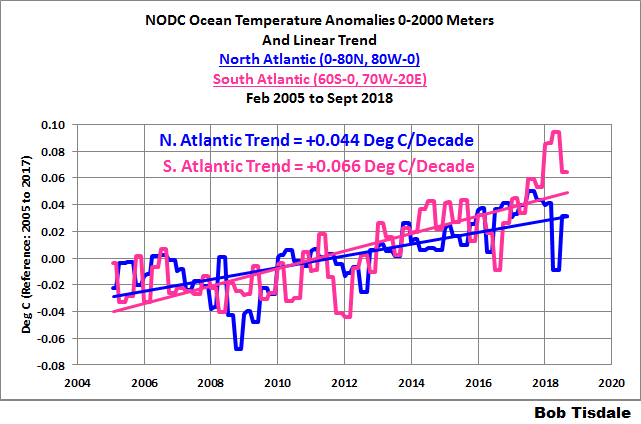 In the Atlantic, as shown in Figure 3, the South Atlantic warmed at a rate that was noticeably higher than the global rate and 50% higher than the rate of the North Atlantic. 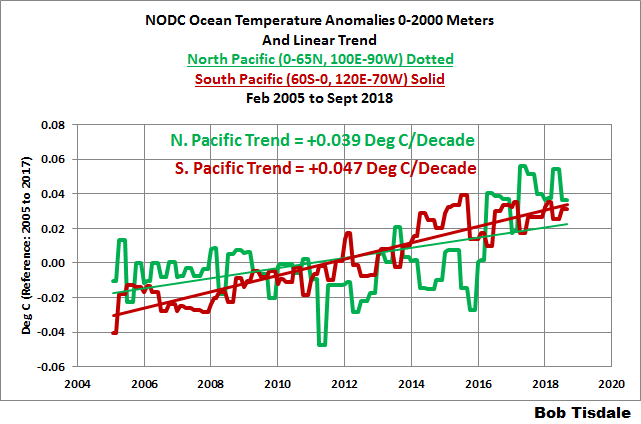 The warming rates are closer together in the Pacific, though, with the South Pacific warming at a rate that was only about 20% faster than the North Pacific, as shown in Figure 4. In this basin, the North Pacific warmed at a rate that was a bit below the global rate. The North Indian Ocean is so small I didn’t bother to divide that basin into hemispheric subsets. 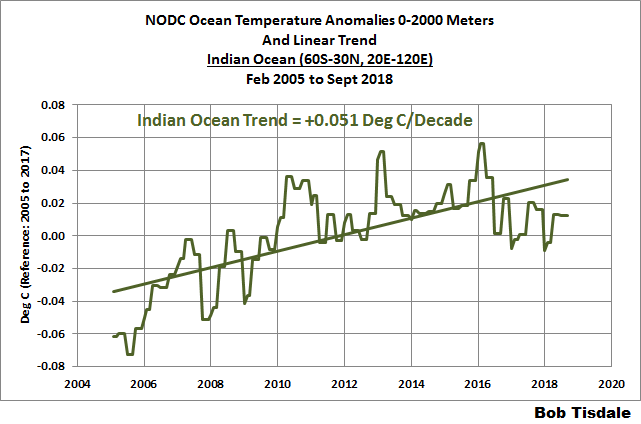 The Indian Ocean, overall, warmed at a rate that is comparable to and a little faster than the global rate of 48 one-thousandths of a degree Celsius per decade. See Figure 5. And that brings us to the Arctic and Southern Oceans. Yes, there are parts of both polar ocean basins that are ice free even in their respective winters. And as you can see in Figure 6, the data for the Arctic Ocean can have large variations from year to year. Not surprisingly, the warming rate of the Southern Ocean data is less than half the rate for the global oceans. 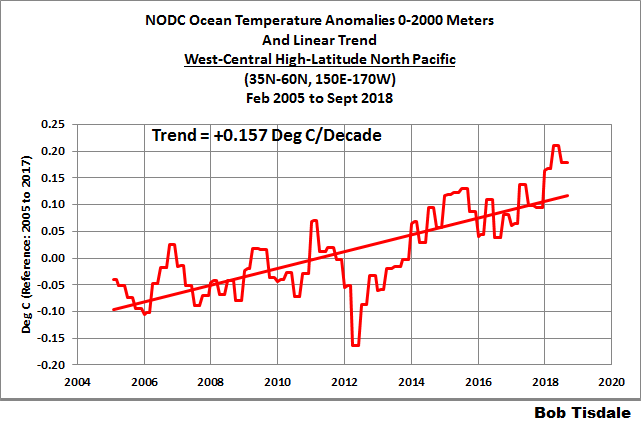 Figure 7 is a map of the North Pacific Ocean that displays the trends in the temperature anomalies for the depths of 0-2000 meters for the period of 2006 to 2017. The scaling of the color-coding ranges from -0.02 to +0.02 Deg C/Year. According to the NOAA webpage here, (link not working due to government shutdown) the North Pacific covers about 21% of the surface of the global oceans, or about 77 million sq. km. To put that in perspective, the North Pacific covers almost as much of the globe as Asia, Europe and North America combined (78.5 million sq. km. ), so the North Pacific is a huge chunk of wet real estate. I was interested to see if The Blob had an impact on the depth-averaged temperature data there. Lo and behold, it appears it has. Note: The Blob was the name given to the area of naturally (weather) warmed ocean (at the surface and to depth) in the eastern extratropical North Pacific. It formed in 2013, coupling with a resilient ridge of high pressure that impacted weather patterns across North America well into 2016. The Blob dissipated in October 2016, as discussed in the post here. (The WattsUpWithThat cross post is here.) Also see the series of posts about The Blob for additional general information. The impacts of The Blob makes one wonder how often a persistent ridge of high pressure causes a portion the ocean to warm at the surface and to depth, only to go unnoticed because it’s happening in a remote part of the oceans. The primary reason The Blob in the Eastern North Pacific was studied was it was close to the west coast of the U.S. and Canada and was impacting regional weather patterns. 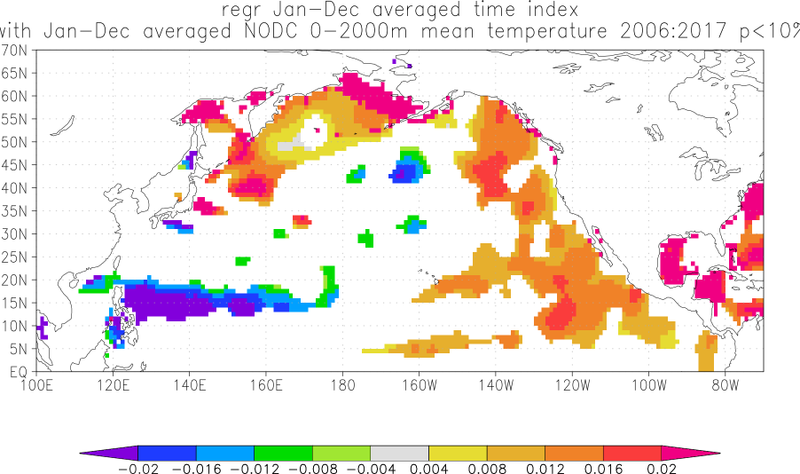 To remove any thoughts you might be having that the warming in the Eastern North Pacific occurred gradually with time, see Figure 8, which presents the depth-average temperature anomalies to 2000 meters for that region as bordered by the coordinates of 10N-65N, 150W-100W, for the period of February 2005 to September 2018. It appears as though the combined effects of The Blob and the 2014/15/16 El Niño put an end to the cooling taking place in the Eastern North Pacific from 2005 through 2013. Does the curve in Figure 8 remind you of another dataset? More on that later in the post. To capture the warming in the West-Central High-Latitude North Pacific seen in Figure 7, I used the coordinates of 35N-65N, 150E-170W for Figure 9. The warming there more than tripled the global rate of 48 one-thousandths of a deg C per decade. The gradual warming there was interrupted by a noticeable dip and rebound in 2012 and 2013. Next is the area of extreme cooling east of the Philippines. Normally, in satellite-based sea level trend maps we see very high sea level trends in that part of the western Tropical Pacific—high trends that are associated with leftover subsurface warm water from El Niño events being returned to the western tropical Pacific via off-equatorial Rossby Waves. One might then suspect the high negative trend there in the depth-averaged temperatures to 2000 meters is also a result of a very strong El Niño, specifically the 2014/15/16 El Nino. See Figure 10, in which I’ve used the coordinates of 10N-20N, 120E-165E to capture that cooling area. 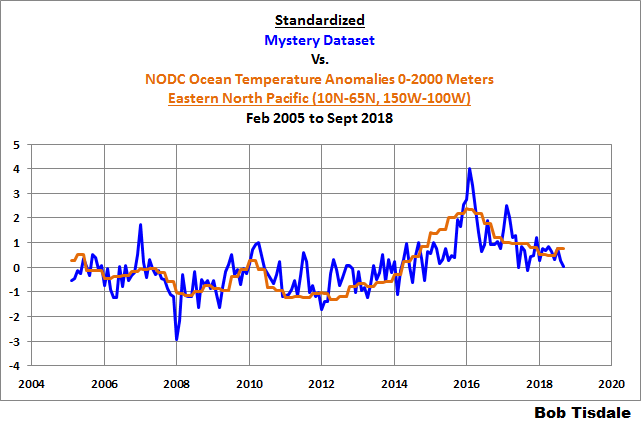 It sure looks like the high rate of cooling was caused by the dip and rebound related to the 2014/15/16 El Niño as the West Pacific Warm Pool was “drained”. 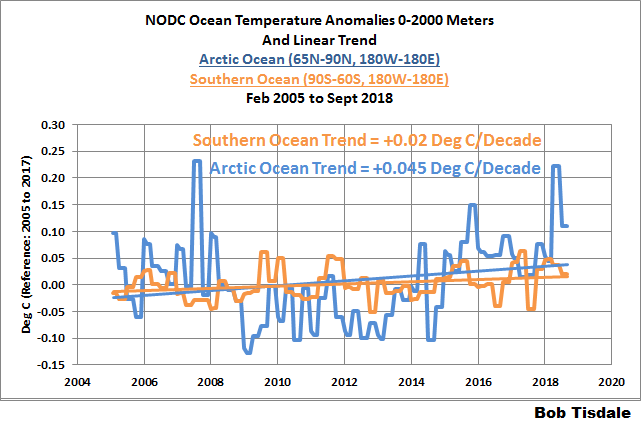 Figure 11 presents a trend map, globally, for the trends in the temperature anomalies for the depths of 0-2000 meters for the period of 2006 to 2017. The scaling is the same as Figure 7. We’ll discuss a couple of those areas in the second part of this post, especially the three obvious regions in the North Atlantic. I’m also curious about the lines of high subsurface temperature trends south and southwest of Australia, and South of the South Atlantic in the Southern Ocean. Are they gradual high rates of warming like Figure 9 or a period of minor cooling followed by a sudden substantial warming like Figure 8? The following is a curiosity. I found it interesting. I’ll let you speculate about it in the comments. Did the curve in Figure 8 of the depth-averaged temperature anomalies (0-2000 meters) for the Eastern North Pacific remind you of another dataset? 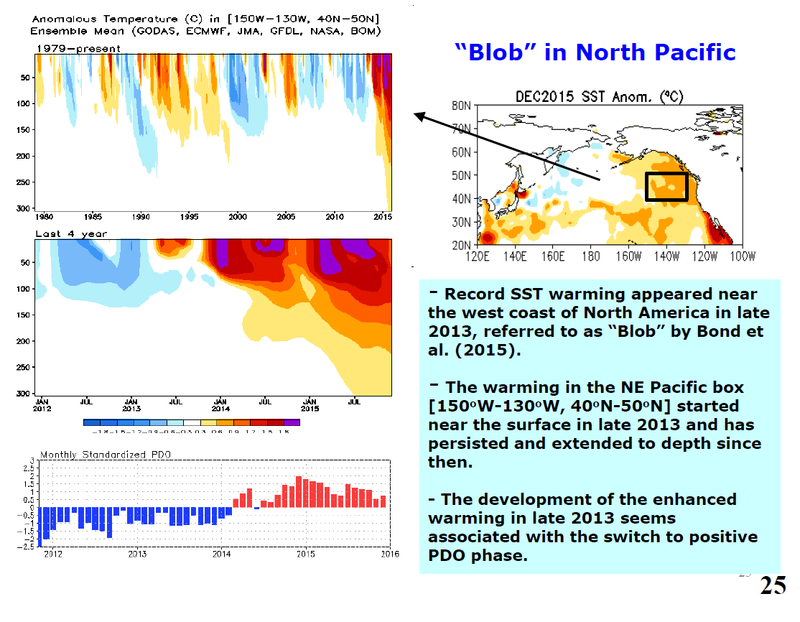 The timing of the big wiggles and big spike in response to The Blob and the 2014/15/16 El Niño? Well, it reminded me of another dataset, that’s for sure. So, for this part of the post, I won’t name the dataset I’m referring to and call it the “Mystery Dataset”. That way you can try to figure out what it is. I downloaded that data for the Mystery Dataset through the KNMI Climate Explorer so that I could set the base years to 2005-2017, the same as the depth-averaged temperature anomalies (0-2000 meters) for the Eastern North Pacific. For the comparison in Figure 12, I’ve standardized the depth-averaged temperature anomalies (0-2000 meters) for the Eastern North Pacific and the Mystery Dataset. Have you figure out the source of the Mystery Dataset. That is, to standardize, I divided each dataset by its respective standard deviation. No cheating and looking ahead. 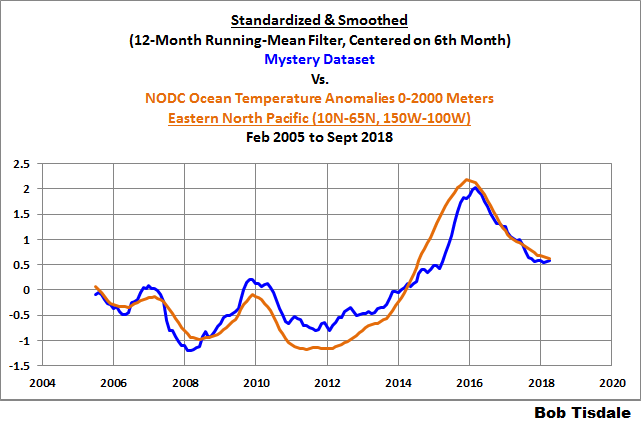 The Mystery Dataset is noisier than the depth-averaged temperature anomalies (0-2000 meters) for the Eastern North Pacific, so I’ve smoothed both with 12-month running mean filters, centered on the 6-month, in Figure 13. Obviously, The Blob and the 2014/15/16 El Niño had major impacts on both datasets. Have you guess the dataset presented as the Mystery Dataset? The answer is here. Thanks again, Bob. As before, I’ll go over to WUWT to see the comments, but I’ll keep an eye out on your site. Bob 2 qs: 1. how accurate are these instruments which measure the upto 2000 meter temp reading? 2. At that level, what human activity can impact. since land is only our current habitation, how much can say the activities can impact ocean level . Bob: After reading Rud’s article, I emailed the information address at the ARGO site and asked what was known about the drift in temperature sensor observed in floats that have been retired and retested. Only a few have been looked at. I was told that the lifetime drift specification for a float temperature sensor was +/-0.002K and the typical float lasted five years. Warming at 1900 meters is about 10X bigger (0.02 K over 15 years). Bob: I greatly appreciate seeing your graphs at WUWT in degC. 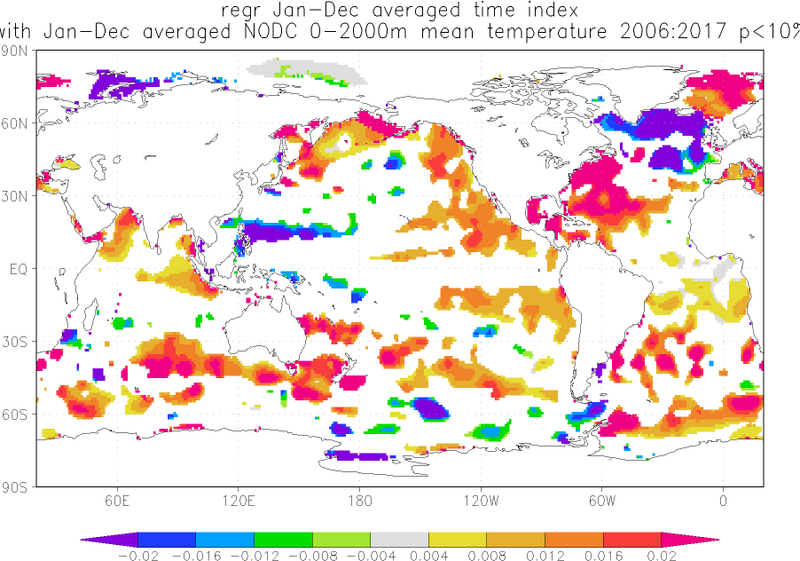 However, I find a single value for the warming of 2 kilometers of ocean fairly meaningless. Do you ever that the ocean apart layer by layer? Let’s consider the 100-300 m layer. It has warmed at X degC/decade. That warming is the net result of enough heat from above to warm Y degC/decade and the loss of enough heat to the depths to cool at Z degC/decade. Wouldn’t data of this type provide a clearer understanding to what is happening? Here’s a question for Bob or anyone if they have the time. At Dr Cowton’s York uni tool the trend from 1910 to 1950 is 0.125c/decade and the trend from 1950 to 2019 is also 0.125c/decade. Can anyone offer an opinion about this data? Here’s the York Uni tool link. ngard2016, you compared a trend for a period of 4 decades to a trend for period of almost 7 decades. Try the last 4 decades for your comparison. Bob, can you provide more detail on how you created your trend maps in climate explorer, figures 7 & 11. I can’t seem to find or generate the Jan-Dec average time index that was regressed with the Jan-Dec averaged NODC 0-2000m mean temperature. Thanks. Bob I also posted this comment about a month ago at Roy Spencer’s blog and you thanked me for the 2010 BBC Phil Jones link at that time. So yes I am aware of the higher trends in the last 30 to 40 years or so. Here’s my comment from Roy’s site on 20th Dec. Just a pity that they increased the 1975 to 2009 trend from 0.161c/dec ( Jones’s 2010 BBC interview) to 0.193c/dec in just 8 years. Why is that I wonder? Here’s the BBC’s Q&A of Dr Phil Jones in 2010 after the Climategate scandal. This is question A below and his answer. He lists 4 warming trends and if we test those SAME trends today we find that the two earlier trends have been adjusted DOWN and the two later trends have been adjusted UP, although the 1975 to 1998 trend not so much. But the longer 1975 to 2009 trend has today been adjusted up from 0.161c/dec ( 2010 interview) to now 0.193c/dec. Here’s the BBC link. So no statistically significant difference just 8 years ago, (between the 4 warming trends) but since changed through their adjustments. “Phil Jones is director of the Climatic Research Unit (CRU) at the University of East Anglia (UEA), which has been at the centre of the row over hacked e-mails. So, in answer to the question, the warming rates for all 4 periods are similar and not statistically significantly different from each other”. See York Uni tool ( Cowton etc) link here for HAD Crut 4 global. Had Crut 4 global is the longest and preferred data-set of the IPCC. Renee, to find the trend mapping feature for that dataset at the KNMI Climate Explorer, on the “Field” page for “NODC 0-2000m mean temperature”, select “Correlate with a time series” from the “Investigate this Field” menu on the right. once you’re there, select time and regression. Then fill out the remaining fields as you want for your map. It may take a little trial and error. Hi bob… the blob trying to return? I was looking for whats up with pdo on this report but they seemed to have replaced it with a blob update. CTM ran a “No More Blob” post at WUWT about a month ago. Between 1950 and 2020 the top 700 m of ocean have accumulated about 20 E22 Joules.